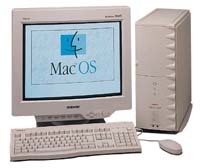 Over the past week I've upgraded my work computer, a G4/400 Yikes!, from Mac OS 8.5.1 and my home computer, a SuperMac S900 with a 333 MHz Newer Tech G3 card, from Mac OS 8.6. Both are now running Mac OS 9. I never could get 8.6 stable on my work computer, but 8.5.1 was just fine for me until I tried to install Adobe GoLive. That software requires 8.6 or later. (It also requires 46 MB of memory and really wants 64 MB!) Since I'd had problems every time I updated to 8.6, I decided to go all the way to OS 9. Besides, I'd have to have it installed before I could experiment with OS X. My home computer has a whole lot of third-party bits and pieces. Being a clone, I guess you could call it a 100% non-Apple computers - except for the Mac OS. In addition to the stock 2.1 GB SCSI hard drive, which I'm reserving for OS X, I have a TurboMax IDE card connected to a 15.2 GB IBM hard drive, an ixMicro Ultimate Rez video card, the SuperMac E100 fast-wide SCSI and 100Base-T card, a USB card, an ixTV card, and the previously mentioned Newer Tech G3/333 card. My home computer has been hanging with sporadic regularity for some time. It would just lock up several times a day, requiring a forced restart. You run Norton. You run Disk Warrior. You do a clean System install. And eventually you get tired of it. So I finally decided it was time to install Mac OS 9 on my home computer. I've had it for months, but always one thing or another kept me from actually installing it on my main drive. The last big obstacle was Copy Doubler, a utility I absolutely depend on for copying my Web pages between hard drive and Zip, but which simply didn't work under OS 9. At Macworld Expo the solution arrived; Connectix released Copy Agent. I bought a copy without hesitation. I also knew QuicKeys 3.5.x wasn't compatible, so I ordered an upgrade to QuicKeys 5.0 - and then downloaded the 30 day demo from CE Software's site. I'm certain the new copies will arrive before the 30 days run out. Truth be told, I'd already installed Mac OS 9 on another partition just to play with it, so I knew it would work. And I discovered one interesting and surprising truth: installing OS 9 over your active System takes about forever, but installing it when booting from the CD-ROM is a whole lot faster. That made the installation pretty quick - under 20 minutes from start to restart. And then there were the System updates: 9.0 to 9.0.4, then a new Software Update control panel, then look for more software updates. That stretched my 20 minute installation to over two hours. Although the kids sometimes use my computer, I don't plan on setting up the Multiple User options. In fact, I'll probably disable all that stuff. It's a nice idea, but probably not necessary on a personal computer. Mac OS 9 has been remarkably stable. My computer hasn't seized up once since installing it. I'm guessing that's due to the improved memory protection. My Internet connection seems smoother than ever, and possibly even faster. I'm very pleased in that respect. I tend to have a lot of applications open at once: Emailer, Internet Explorer, Home Page, ClarisWorks, Mizer (now called Space Agent), TextSoap, Photoshop, and GraphicConverter are at the top of my heavily used applications list. If anything, OS 9 seems to switch between applications more slowly. And here's a really weird one: my screen looks better than ever. I don't know why that would be, but the colors seem richer, the contrast a bit better, and the sharpness sharper. Maybe that's just subjective, but it's certainly nothing I expected. After almost a week on OS 9 at work and a day with it at home, I'm very pleased with the stability. My G4/400 Yikes! at work seems every bit as fast as it was under OS 8.5.1 - and I can play with GoLive 5, which I couldn't do under 8.5.1. This seems to have solved the problem with my SuperMac seizing up in the middle of something. That often happened when switching between applications, but not always. Now it appears to be history. That could give me an extra 20 minutes of productive time each day! Of course, the real reason for the upgrade was the OS X Beta, which arrived late last week. I'm not yet sure I dare try it on my work computer. I'd love to use it on one of my SuperMacs (my workhorse S900 or my "spare" J700), but so far it has refused to install. One suggestion is installing an Apple CD-ROM, but I just don't have the time to dismantle hardware and scarf a drive from an old Quadra or Power Mac 6100. Until then, I'm very happy with Mac OS 9. It seems pretty bulletproof on my home and work computers. I can hardly wait to see if OS X can be more stable than this.